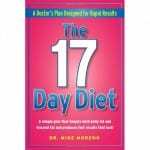 If you love fixing things fast you’ll love the idea behind the 17 Day Diet. Most diet and exercise programs want you to commit for at least 30 days, and some want you to go for 90 days. But the man behind this diet says that this is all the time the body needs in order to cleanse itself and lose weight. But how can this be true, and will there ever be a 16 day diet to best it? There will always be a new diet program to hit the market because someone will always think up a new angle or a new gimmick that seems to make sense to the masses. It is also one of the easiest products to hype because people are ravenous for weight loss, especially quick weight loss. That’s why you’ll see products like 8 Minute Abs and 17 Day Diet. Promise people a short time commitment and you’ve already got one foot in the door. The book and author claim that 17 days is all you’ll need to commit to in order to see the results shown in the before and after photos. Some in the testimonials have said that they lost several dress sizes and one women proclaims that she lost 25 pounds. Hype for weight loss programs is built in. No one wants to be the last person to find out about the next great diet program. It’s a psychological feeling like you’re the only one that doesn’t know about it, and therefore you’ll be the last fat person left on the planet. With this program hype is built into the name the 17 Day Diet. Anything that promises results that fast is begging for hype and buzz. Seeing the author make the talk show rounds just adds to the obviousness of him wanting as much hype and hoopla surrounding his book so that he’ll make a lot of sales and become quite wealthy. Although he states that the program is sustainable, meaning that you will continue to lose weight even after 17 days, or that you can continue on with the eating methods even after that time has passed, it’s very unlikely that either of these claims are true. The cost of the book is a regular price of around $14 if ordered through Amazon. You might notice that it has quite positive reviews there. You should never buy anything that has anything that doesn’t resemble a bell curve in the ratings. These reviews have obviously been manipulated by the author. It is not very hard to get positive reviews for your book on Amazon, so you should not pay any attention to them. You have to be willing to commit to the 17 Day Diet, which is a little over 2 weeks. Everyone claims that this is easy because it’s so short, but it still isn’t long enough to form a habit, which usually take about 30 days to instill. In order for this diet to stand a chance you’ll have to follow it to the letter and not miss any of its recommendations. There’s no secret behind what is being taught in the 17 Day Diet. It’s the same sort of meal combinations and dieting tips that have been around for the last decade. The real beauty is the packaging and marketing that are being used to promote the book. The author, Mike Morena, is a handsome guy and although there are some men featured in the testimonials the book seems geared towards women with it’s bright pink cover. In the end this is just another fad diet that may perhaps give you some results in the short term, and many women will no doubt buy it in an attempt to fit into a dress by a certain date. But you can get safer results from following a more modest approach, and not treating your body like it’s an experiment with rapid weight loss. You can happily ignore the 17 Day Diet because if you’ve tried any other weight loss program in the last 10 years you will already know about what you should do. Eat the right foods. Get good sleep. Exercise regularly. Do these simple things every day and you’ll never have to worry if something like the 17 Day Diet works or not, because you just won’t need it to. What do you think? Does the 17 Day Diet work or not? What a pompous review. And one that is entirely missing the point of the 17 day diet. There is not a person alive that doesn’t understand that change of lifestyle, healthy eating, and exercise is the best way to generate weight loss and sustain it properly. However, The great thing about the 17 day diet is it shocks your system immediately. The benefit is you are encouraged to stay with it because you get real, tangible results very quickly. That helps promote your willingness to see it through, and during those first 17 days you slowly are rebuilding healthier habits. Additionally, the diet is laid out simply and very easy to follow. You know exactly what you can and can’t eat, what to buy at the grocery, and how to follow your progress. There is no guessing. The one key is though you do need to stay strict on it the first 17 days. But you can do anything for that time period! I can tell anyone out there that this this is absolutely working for me. For the weak-willed (like me), and the folks that need a quick validation that it’s working with tangible results than I highly recommend trying it. I am terrible at diets, and I completely understand it’s my fault that they have been broken in the past. But this system has me excited about weight loss and sustaining the habits I have been practicing, for the first time in years. As a side bonus my cholesteral is improving, and for me personally that was a huge goal. Don’t listen to the naysayers. If it was so easy to just exercise, eat right, etc. there would be not weight issues in this country. The fact is most people out there are like me-good hard working folks, busy as can be every day, and along the way have developed terrible eating habits and less enthusiasm or will-power for dieting. It makes no difference to me if you believe me or not, but I felt compelled to write a rebuttal to the above review. Here is hoping anyone that tries this method sees the positive results I have. Good luck! My niece lost 40 lbs and she has tried many weight loss programs. She loves it because you see fast results and the meals are quick and easy to fix. I am going to give it a try! I can’t even tell you how many people I have seen swear by this. It really seems to be legitimate in its ability to provide results to those who are willing to stick with it. When it comes to weight loss, it is so important to find a program or regimen that works for your body and leaves you feeling healthy and strong. Every body is so different but it appears that the 17 Day Diet seems to work more often than not. If you are looking for a new program to follow, it appears to meet with results most of the time. I have tried the 17-day diet in the past, and it worked perfectly for me. You have to stick with the program and develop healthy eating habits, and you will see results. I would recommend the program. It works! People at work asked me what I was doing. I bought several books and handed them out. One women lost 60 or 70 pounds over a year and eventually had normal blood pressure and off all medication. I lost 25 pounds and normal cholesterol without being medicated. Others had similar results. The best thing is the book has 3 levels each 17 days. Levels 2 and 3 add back foods with level 3 a healthy life time habit. If you go off by eating surgery processed foods and gain weight. Go back to level 1.